The Motorola DynaTAC series was the first commercially-available, completely-handheld cellular phone. A full charge of the brick-style phone's battery took ten hours, and offered half an hour of talk time. 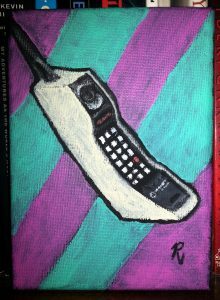 The phone has since become iconic to the 1980s in general, and Yuppies in particular. DynaTACs are used by characters of privilege in productions such as Wall Street, Saved By the Bell, and American Psycho. Thoughts and opinions I express on this website are my own, and don't necessarily represent those of associates, colleagues, or fellow southpaws.